11:52 a.m. – An officer dealt with a lost and found article. 12:03 p.m. – A report of disorderly conduct on Shapleigh Rd. was investigated. 1:50 p.m. – A resident of Brave Boat Harbor Rd. called to report their dog missing. 4:50 p.m. – Following a report of a vehicle being operated in an erratic manner on Route 236 the driver of the vehicle was summonsed for driving to endanger. 10:35 p.m. – An alarm from a business on US Route One was investigated and found to be a false alarm. 10:25 a.m. – A report of criminal mischief on Route 236 was investigated. 3:19 p.m. – An officer assisted another agency on Moore St.
4:17 p.m. – Officers responded to the US Route One Bypass for a disturbance. Peace was restored. 5:34 p.m. – A citizen came into the police department to report the theft of a bicycle from Dennett Rd. 5:41 p.m. – An officer assisted the fire department at the scene of a brush fire on Brave Boat Harbor Rd. 11:00 p.m. – a report of a domestic disturbance on High Pasture Rd. was investigated. 5:55 a.m. – A two vehicle motor vehicle accident occurred on Pepperrell Rd. 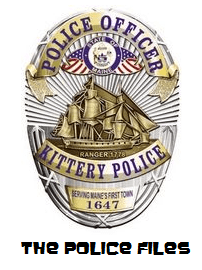 7:44 a.m. – An officer responded to Dismukes St. for a report of criminal mischief. 11:49 a.m. – A resident of Armour Dr. came into the police department to speak to an officer regarding disorderly conduct. 12:20 p.m. – A caller from Dismukes St. reported a violation of a court order. 12:33 p.m. – An officer investigated suspicious activity they observed on Dion Ave.
1:47 p.m. – Suspicious activity on Shapleigh Rd. was investigated. 2:47 p.m. – Following an animal complaint on State Rd. a found dog was taken to Creature Comforts. 10:00 p.m. – A citizen came into the police department to turn in a found credit card. 7:27 a.m. – An officer responded to the area of Wentworth St. and Whipple Rd. for a lost and found bicycle. 8:33 a.m. – An officer attempted to serve a warrant on Old Dennett South Rd. 9:09 a.m. – A single vehicle motor vehicle accident occurred on Walker St.
10:56 a.m. – Criminal mischief was reported on US Route One. 12:05 p.m. – Jason Lee Hare, 39, of Portsmouth, NH was arrested on another agency’s warrant. 6:14 p.m. – Alost article was found on Wallingford Square. 9:11 p.m. – An alarm on Drake Lane was investigated and found to be a false alarm. 1:45 a.m. – A noise complaint on Pepperrell Rd. was checked and determined to be unfounded. 6:16 a.m. – An alarm received from a business on US Route One was found to be a false alarm. 9:41 a.m. – Officers assisted another agency on the US Route One Bypass. 11:58 a.m. – Following a report of shoplifting from a business on US Route One Tenika Marie Lavoice, 26, of 368 Washington St, Dover, NH was arrested for theft by receiving stolen property. 5:30 p.m. – US Route One was checked for a dog left in a hot vehicle. 11:33 p.m. – Officers responded to a report of a burglary on Ledgewood Dr.
10:55 p.m. – A citizen came into the police department to turn in a cell phone found on Pepperrell Rd. 2:50 p.m. – Keys found on Brave Boat Harbor Rd. were turned in at the police department. 9:00 p.m. – An officer spoke to a caller regarding suspicious activity. 7:33 p.m. – A two vehicle motor vehicle accident occurred on Route 236. 10:01 a.m. – A wallet was reported lost on Pocahontas Rd. 11:03 a.m. – An officer responded to US Route One for two vehicle motor vehicle accident. 11:48 a.m. – A report of suspicious activity on Lewis Rd. was received. 12:01 p.m. – A cat was reported lost from Wallingford Square. 3:24 p.m. – Officers assisted the fire department on Norton Rd. when the fire department dealt with a wire on fire do to a fallen tree limb. 3:39 p.m. – An officer responded to Manson Ave. for a report of disorderly Conduct. Peace was restored. 4:13 p.m. – Cherie Rose Littlefield, 44, of 24 Old Dennett South Rd. Unit #B was arrested on another agency’s warrant. 6:10 p.m. – Larry A Blethen, 70, of 2 Ryle Lane was arrested on a warrant. 10:03 p.m. – A report of the theft of a motor vehicle on Tenney Hill Rd. was investigated. 11:52 p.m. – An alarm from a business on US Route One was determined to be a false alarm. This entry was posted in General Town News on June 30, 2014 by Chuck Denault.